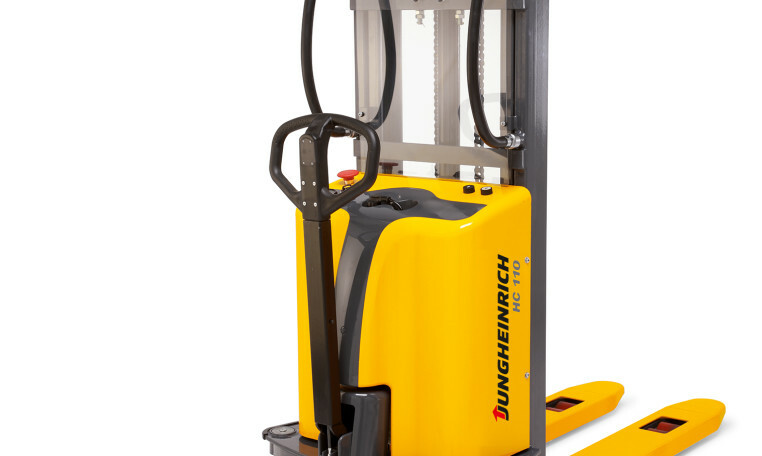 The Jungheinrich HC 110 electric hand stacker offers a cost-effective option for carrying out occasional stacking operations (1600 to 3000 mm lift height) and loading and unloading commercial vehicles. The manually operated Jungheinrich HC 110 with its electric lift is also used as a work bench in many areas. The Jungheinrich HC 110 draws the energy it requires from a maintenance-free battery. The electric hand stacker offers a cost-effective option for carrying out occasional stacking operations (1600 to 3000 mm lift height) and loading and unloading commercial vehicles. The manually operated HC 110 with its electric lift is also used as a work bench in many areas. The HC 110 draws the energy it requires from a maintenance-free battery. A built-in charger allows easy and reliable charging of the integrated battery at any standard 240 V mains socket. Automatic guidance of the steered wheel ensures easy manoeuvrability of the HC 110. For occasional stacking and retrieval up to a lift height of 3000 mm, the HC 110 offers a cost-effective alternative to trucks with drive motors. The wide variety of masts available (1600, 2500 and 3000 mm) and its powerful 1.5 kW lift motor make it suitable for a wide range of applications. For instance, with the 1600 mm mast the HC 110 is suitable for loading and unloading commercial vehicles, for stacking one pallet on top of another, and for use as a work bench. The electro-hydraulic lift control and easy accessibility of the lift and lower control buttons ensure precise fork positioning. All controls and displays are clearly arranged. The maintenance-free battery eliminates the tedious operation of topping up the battery with water. The battery discharge display provides a continuous indication of the actual state of charge. The built-in high-frequency charger allows the battery to be charged from any 13Amp plug socket. Easy handling using ergonomically arranged control handles. Long tiller allows effortless operation. Foot guards on the steered wheels give additional operator protection. Safe parking in any situation via the mechanical parking brake. Automatic control of the steered wheel by means of a drive chain ensures the electric hand stacker is particularly easy to manoeuvre.